I've applied for dozens of credit cards over the years and cashed in thousands in free airfare doing it. I'm also wary about offers that would take me out of my normal monthly credit card spending (around $1000/month). To keep it simple and not waste my time, I wait for the big bonuses. Usually if I have to spend more than $2000 to activate the bonus or the bonus is under $300 cash value (airline points or a check), I don't bother. 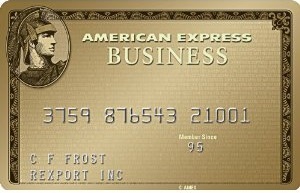 Some AMEX Business cards have $10,000 minimum spending in 3 months to activate the bonus! Too much commitment to spending for too little gained. AMEX sent me two offers that would require $3000 worth of spending. The bonus? 125,000 Delta Skymiles points. Worth it? I cashed in 80,000 points (plus $20 in fees) for two tickets to Miami for this summer. I checked the price just before I booked. If I had booked them and paid cash, they would have come out to $1,467.20. Another way to look at it is: 80,000 points for $1,467.20 = 1 points = $0.018. Almost 2 cents per point. Considering most credit card companies only offer a penny a point if you take cash back, this is quite a good deal. Granted, I wouldn't book these tickets at that price. I would definitely search on flights.google.com or some other site to find a better deal. Cashing in 80,000 points left us with 39,000 from the welcome bonuses, almost enough for another round-trip ticket. 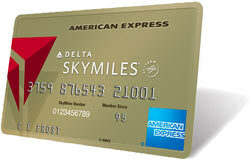 With another $1000 of spending on the AMEX Delta Skymiles card, we can get another free ticket. The two pre-selected credit card offers arrived in February from American Express. One was for an American Express Business Gold Card. The other was for a American Express Delta Gold Card. The Business required $2000 of spending for a 75,000 bonus reward points which could be transferred to Delta Skymiles program for a small fee. The AMEX Delta required only $1000 of spending for 50,000 points. We received our bonus points within 2 weeks of receiving the card. Very easy. The Skymiles posted with 24 hours of me paying off the charges. For the AMEX Business Gold, I applied as a sole proprietor and used my Social Security number rather than a business tax ID number. This is completely legal and almost all “business” credit cards can be obtained by individuals. For this card, we put one month of our expenses on the card and a couch we've been saving to buy. We met the spending requirement in 6 weeks and as soon as the second month's statement posted, the Membership Rewards points were credited to our account. The Membership Rewards points waited until the statement closing date to post to my account. 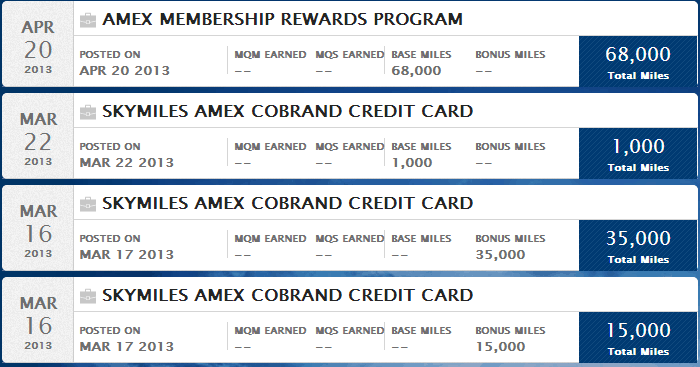 These weren't Skymiles yet, but AMEX offers you the option of transferring your points to several air carriers. I already had several thousand Delta Skymiles, so I decided to get my free ticket through Delta. Once I had the 76,542 Rewards points in there, I went to the Membership Rewards center and transferred the points to my Skymiles account. There was an “excise tax” charge of $40 or 8000 points. I chose to pay in points, which is why I'm a few thousand short of my 125,000 promised in my Skymiles account. The Membership Rewards points posted to my Delta account in less than 5 minutes. I booked two round trip tickets to Miami that would have cost me over $1400 for only 80,000 points and $20 in fees moments later. Not bad for just using a different credit card for 6 weeks. 98% savings. Thanks, Delta and AMEX! Both cards carry an annual fee, which is waived indefinitely for US military servicemembers. 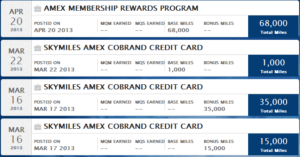 That saved me $175 per year for the AMEX Business Gold and $95 for the AMEX Delta Gold. Since applying for these cards, I've held many other American Express cards and paid no annual fees. I check my score about once a quarter for free from Credit Karma. It's actually free, unlike the scam sites like freecreditreport.com. My score has not wavered by more than 10 points in the year after applying for these cards. ← We are a Proud “Zero TV” Household! Oh and AMEX will refund any annual fees you already paid if you haven’t already done this.